Chef keeps track of how many eggplants he uses with a pictograph. 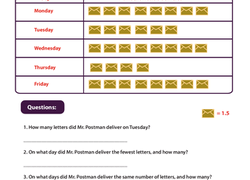 In this worksheet, kids use information in the pictograph to answer word problems. Practice adding multiple digits with a fun pictograph page. Use the chart to draw out the number of items in each problem. In this 3rd grade math worksheet, kids practice interpreting graph data as they use the information in a pictograph to answer a set of questions. In this 3rd grade math worksheet, kids practice interpreting graph data and using information in a pictograph to answer word problems. 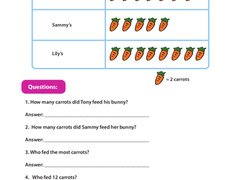 Kids use information in the pictograph to answer word problems in this bunny-filled math worksheet. Kids practice reading a pictograph to help Mr. Farmer figure out how many tomatoes he picked in this worksheet. 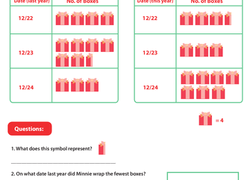 Use a pictograph to find out how many presents Minnie wrapped this year. 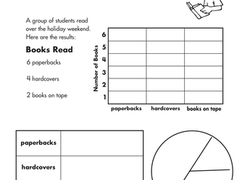 Practice drawing data onto a pictograph with this counting and adding worksheet. Fill in the pictograph to help you visualize the problem first. The Chinese character for "fish" came from a pictograph thousands of years old! Help Sam, Kate and Becky keep track of how many ice cream cones they've sold, and draw this data into a pictograph. Exercise pictograph skills in this worksheet. Help them keep track of their sales by filling in a pictograph, and then answer a few math questions. Help them keep track of their sales by drawing in a pictograph, and then answer a few math questions. Your child will keep track of their sales by drawing the data into a pictograph.